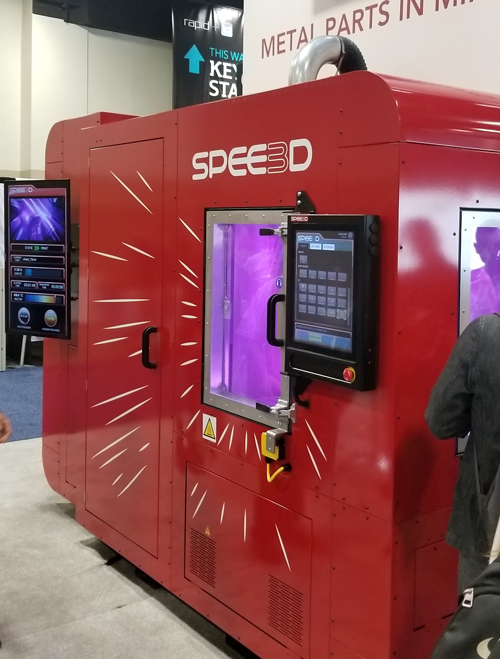 Spee3d drew a crowd at RAPID + TCT with its patented technology, in the form of a metals-based 3D printer employing air-fed deposition. Rather than using heat to melt metal powders, Spee3d employs supersonic deposition, where a nozzle accelerates air to as much as three times the speed of sound to deposit injected powders onto a substrate attached to a six-axis robotic arm. The kinetic energy of the particles, explain company officials, causes the powders to bind together to form a high-density part with normal metallurgical properties. On display along with the printer: a copper flywheel that took 11 min. 38 sec. to produce, at a cost of $6.85. The same part would take hours to produce and prohibitively expensive as a printed one-off item, according to Byron Kennedy, co-founder and CEO of the Australian company. The printer’s integrated design includes an enclosed build chamber (max. part size: 300 by 300 by 300 mm; max. part size: 3000 g), powder feeder, electronics and print head, along with touchscreen HMI and high-speed robotic unit. It offers build rates to 100 grams/min., with the automated build process using an STL CAD file to produce a near-net-shape part. The technology ideally is suited for producing parts currently designed for sand or die casting, according to Kennedy, who claims the process, currently qualified for aluminum and copper, is 100 to 1000 times faster than laser-based 3D printing. For more new technology on display at RAPID + TCT and the 2018 AMUG Conference and AMUGexpo, see the Summer issue of 3D Metal Printing, set to mail in early August and then available at www.3dmpmag.com.